Update: This batch sold out in 20 minutes. We will release one more smaller batch in the coming weeks. 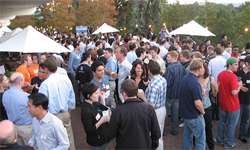 We are releasing the next batch of 200 tickets to the 3rd annual August Capital MeetUp on Friday, July 25, 2008, in Menlo Park, California. Our last release of tickets sold out in less than 15 minutes, so we recommend you register now if you plan on attending. Tickets are available at EventBrite. The August Capital MeetUp is one of our most popular events attended by startup founders, the venture community and dozens of members of the media. This year, prior to the August Capital MeetUp, I will be hosting a Roundtable Discussion and Debate at the Quadras Conference Center. The Roundtable will explore the new business opportunities presented by the iPhone and Android mobile Web platforms (and others), and debate which one is more promising. It will include startup founders, developers, and VCs trying to bring the full Web to our phones, as well as executives from larger companies trying to do the same. I am still filling out the Roundtable list, so please ad suggestions of people you’d like to see in such a debate in comments. We will be covering the discussion on TechCrunch, possibly broadcasting it live so that everyone can participate. Stay tuned for additional details about this Roundtable over the course of the next few days. We have branded sponsorship opportunities and demo stations available for both the August Capital MeetUp and the Quadras Conference Center Roundtable. If you are interested in supporting these events, please contact Jeanne Logozzo or Heather Harde. If you are a member of the press wanting to cover the event, please contact Sarah Ross. Since we have limited capacity for the August Capital MeetUp, we are asking a $10 cover charge to help manage the attendee list and minimize no-shows. We will donate 100% of the ticket proceeds to Malaria No More, an inclusive, grassroots movement to control malaria, a preventable and treatable disease that kills more than one million people each year. Attendee identification will be checked at the door. Due to the strong demand for tickets, we regret tickets are not transferable and not refundable. If you use your name to purchase multiple tickets, your guests must arrive with you to check in at the door.